F Roman Tvrdoň (Spokane, 1999-2001) has signed a contract for the rest of this season with Landshut (Germany, Oberliga). Last season, with Piešťany (Slovakia, Extraliga), he had three goals and four assists in 27 games. . . .
F Eric Johansson (Tri-City, 1997-2002) has signed a contract for the rest of this season with Herning (Denmark, Metal Ligaen). Last season, he had seven goals and 19 assists in 23 games with Riessersee Garmisch-Partenkirchen (Germany, DEL2). . . .
D David Hájek (Spokane, 1998-99) has signed a contract for the rest of this season with Weiden (Germany, Oberliga). Last season, he had three goals and one assist with Heilbronner Falken (Germany, DEL2). Islanders’ first 13 games this season, seeing a grand total of 19 minutes 30 seconds in ice time. Last week, he was said to be battling strep throat. 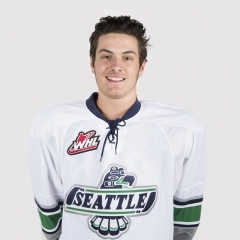 Barzal will be playing in his fourth WHL season. He put up 88 points, including 27 goals, in 58 games last season. The Thunderbirds next play Friday in Kent, Wash., against the Calgary Hitmen. Barzal’s return will give Seattle head coach Steve Konowalchuk the option to reunite one of the WHL’s top lines pf last season — Barzal between Ryan Gropp and Keegan Kolesar. However, that may not happen until some time in January. Kolesar had surgery to repair a supraumbilical hernia while with the NHL’s Columbus Blue Jackets and isn’t expected back for another week or two. Meanwhile, Barzal is certain to be invited to attend the Canadian national junior team’s selection camp. That list is to be released on Nov. 29. Should Barzal be on Team Canada’s final roster, he would be lost to the Thunderbirds until after the 2017 World Junior Championship, which is to conclude on Jan. 5. Barzal had two goals and an assist for Canada at the 2016 WJC. The Oshawa Express is reporting that there are three teams left in contention to play host to the 2018 Memorial Cup, which will be mark the 100th anniversary of the trophy. Joel Wittnebel of the Express writes that “according to sources, (the) list now has been narrowed down to three possible host teams who have submitted bids: the Hamilton Bulldogs, Regina Pats and Oshawa Generals.” . . . RoccoTullio, the Generals’ owner, said: “That’s what we’ve been told.” . . . Wittnebel’s story is right here. . . . The Pats are the oldest junior hockey team in North America; they will mark their 100th season in 2017-18. However, they are embroiled in nasty negotiations on a new lease, something that may well end up knocking the city out of the bidding. The BCHL’s Salmon Arm Silverbacks fired head coach Brandon West on Wednesday. Troy Mick, the franchise’s president and general manager, made the announcement. . . . West was in his fifth season with the organization, the third as head coach. The Silverbacks were 91-83-20, with eight ties, under West. This season, the Silverbacks are 8-14-0, good for sixth in the six-team Interior Division. They are three points out of fifth place and four out of third. . . . Assistant coaches Brooks Christensen and Darrell Hay are running things on an interim basis while a search continues for a new head coach. . . . Last season, the Silverbacks finished 29-20-5-4. They wound up third in the division and made the playoffs for the first time since 2012-13. . . . On June 6, West was signed to a contract extension, the duration of which wasn’t revealed. The SJHL’s Yorkton Terriers have added Mat Hehr to their staff as an assistant coach. He had been the assistant general manager and associate coach with the SJHL’s La Ronge Ice Wolves before leaving following the firing of GM/head coach Shawn Martin last month. . . . With the Terriers, Hehr will work alongside GM/head coach Casey O’Brien. 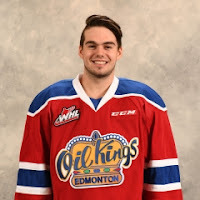 The Edmonton Oil Kings, who are at home to the Saskatoon Blades tonight, have brought in G Boston Bilous, 15, from the Fraser Valley Thunderbirds of the B.C. Major Midget League. A native of Langley, B.C., he was a fourth-round selection in the 2016 bantam draft. . . . As a 15-year-old, Bilous is eligible to play five WHL games before theThunderbirds’ season concludes. The Oil Kings have two other goaltenders — veteran Patrick Dea, 19, and freshman Liam Hughes, 17 — on their roster. . . . The Swift Current Broncos will be without freshman F Riley Stotts, 16, for up to six weeks. Stotts, the 10th overall selection in the 2015 bantam draft, had his skates off in the Canada Red dressing room during last week’s U-17 World Hockey Challenge when he was stepped on by a teammate. The resulting damage to one foot has put Stotts on the shelf. He has four goals in 12 games this season. . . .
Last week, a Vancouver radio station (News 1130 Sports) reported that D Tyler Brown had left the Vancouver Giants. The roster report released this week by the WHL lists Brown as having retired. . . . Brown, from East Olympia, Wash., was a fifth-round pick by the Moose Jaw Warriors in the 2012 bantam draft. This season, he had two assists in 16 games with the Giants, who acquired him from Moose Jaw last season. . . . In 167 career regular-season games, he has three goals and 27 assists. Saskatoon at Edmonton, 7 p.m. Prince George vs. Vancouver, at Langley, B.C., 7 p.m.